Do you hear that rattling? That's the skeleton in your ancestral closet. 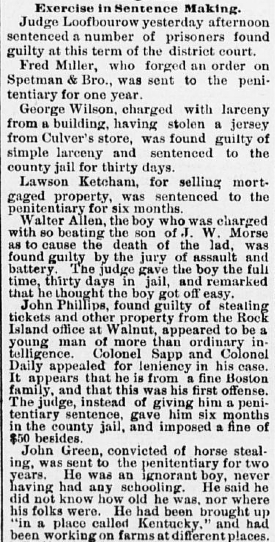 While some people may feel embarrassed by an ancestor's wrongdoing, it's actually an opportunity. An opportunity that can mean more documentation that records the misdeeds of that ancestor. Not sure how to go about researching your black sheep? Start your project just as you would when researching any ancestor. Look for vital records, the census and military records. Once you have exhausted those sources then research with their activities in mind. The following three steps will help you as you look for more information on those black sheep. What did your ancestor do? Everyone may have a different idea of what a black sheep ancestor is. Bigamy, getting kicked out of a school or church, theft, and assault are just some of the many possible black sheep activities. For the purposes of this article, we will concentrate on those who committed a crime. Whatever your black sheep did to earn their title, considering their nefarious activities will help lead you to research sources. Do you have a family member who was the victim of someone else's black sheep ancestor? Researching the assailant can also be beneficial to learning more about your ancestor. My ancestor Moses Henry Chatham was murdered in 1879. It was through researching his killer that I better understood the crime and the outcome of the murder case. Resources I used include newspaper records, court records, and local histories. As you research a trial, don't forget to look into the witnesses. They may have been family, friends or neighbors. Put together a timeline of your ancestor's life and activities. Fill in dates, places, sources and your observations. You can use a word processing program, spreadsheet program, genealogy database or timeline software. Consider this timeline your research log that will document what you have found, and just as important, what you didn't find. Digitized newspaper databases make searching easier than ever before. The benefit of digitized newspaper websites is that they are every word searchable, which means that you can find obscure references to your ancestor in newspapers, and on dates you weren't expecting. When you search for newspapers, make one of your searches a name (without a location) to pick up any references in newspapers outside of their hometown. Depending on the crime, an article may not be limited to a local newspaper; the "bigger" the crime, the more widespread was the coverage. Members of Archives.com and Ancestry.com should definitely make newspapers part of their search strategy. Newspapers.com is dedicated to just digitized newspapers. Other sites include the Library of Congress's Chronicling America and state digitized newspaper projects, such as Utah Digital Newspapers, California Digital Newspaper Collection, and Nebraska Newspapers. Repositories local to where your ancestor lived might also have newspaper collections. Microfilmed newspapers may even be available via interlibrary loan, allowing you to research from your local library. The Kansas Historical Society has a large collection of microfilmed newspapers for the United States, and makes them available through interlibrary loan. Similarly, the Ohio Historical Society has the largest collection of Ohio newspapers; you can also borrow these through interlibrary loan. Be sure to check with state historical societies in the states you are interested in. The great thing about black sheep is they tend to leave documentation in their wake. Once you exhaust the usual documents and newspapers think about what type of paper trail the ancestor should have left behind. Those who do crimes, get to meet the judge. Red Book. American State, County, and Town Sources provides a history of each state and information about obtaining different types of records including court records. From the table of contents, choose the state you are interested in and then the category "court records" available on the list of links on the right hand side. Because the last version of Red Book was updated in 2004, you will want to verify information before you research onsite. Another place that may hold the court records you need is a state library or archive. The Council of State Archivists maintains a directory of state libraries, archives, and records programs. Libraries in the United States is another good website to check for all types of libraries in the state where you are researching. If you decide to take a field trip to research court records, do your homework beforehand. In some places, you can access and research court records with ease but in other places it will be all but impossible. If you have never researched court records before, I suggest reading Christine Rose's Courthouse Research for Family Historians: Your Guide to Genealogical Treasures (2004). There are websites that include databases that aid black sheep researchers. Blacksheep Ancestors provides various databases for the United States and abroad. Its California page includes prison registers for San Quentin, Alcatraz and Folsom as well as small jails like Lincoln Heights (Los Angeles), and Kern County. Don't forget to also search on your favorite genealogy website for criminal and court records. Ancestry.com has a section for Court, Governmental & Criminal Records. In this category, you will find databases such as the Atlanta, Georgia, U.S. Penitentiary, Prisoner Index, ca 1880-1922; Leavenworth, Kansas, U.S. Penitentiary, Prisoner, Name Index to Inmate Case Files, 1895-1931; and Alabama Convict Records 1886-1952, as well as others. Our ancestors were human, just like us. They had their strengths, their weaknesses and, just like us, the occasional misstep. We may not like to think about our ancestors' less-than-perfect sides. However, we learn more about them if we consider the whole person, warts and all.